Worldwide icon-chevron-right North America icon-chevron-right United States icon-chevron-right Illinois icon-chevron-right Chicago icon-chevron-right "The Picture Tells the Story"
"The Picture Tells the Story"
Yoakum, Mt Pikes Peak the mtn of Pleasure Highest foot Bridge near Colorado Springs Colorado in U.S.A. (detail), no date. “Girl, there’s nothing I haven’t suffered to see things firsthand,” Joseph E. Yoakum once told the late Chicago artist Christina Ramberg. It’s impossible to separate Yoakum’s adventurous, peripatetic life from his incredible drawings, 34 of which appear in this exhibition. The self-taught artist, whose parents were African-American and Cherokee, was born in Missouri in 1890. Before moving to Chicago, where he lived from the end of the 1920s until he died of cancer in 1972, Yoakum toured the world as a horse wrangler for Buffalo Bill Cody’s Wild West Show, Ringling Brothers and other circus companies; was a soldier in World War I as well as a merchant seaman; and traveled throughout the United States as a railroad porter, apple picker and miner—or so he claimed. Most of the 2,000 drawings Yoakum created after 1962—the works for which he’s known today—depict the places he supposedly visited during his years of wandering. Each is labeled with its location; Yoakum’s elaborate handwritten titles refer to Missouri quarries, the Alps, the Baltic Sea and a diverse range of other sites. Ever since Yoakum came to the art world’s attention in 1967, it’s been difficult to determine the veracity of the stories he told patrons, critics and biographers about his travels—in part because his drawings represent archetypes of topography rather than recognizable details. Yoakum arranges the trees dotting his large-scale depiction of Pikes Peak (pictured) in rows of identical stylized conifers with no branches or leaves. The artist, who outlined the trees in ballpoint pen and colored them a uniform green, also placed them in such unlikely locales as Hawaii’s Pearl Harbor and a Chinese mountain range. 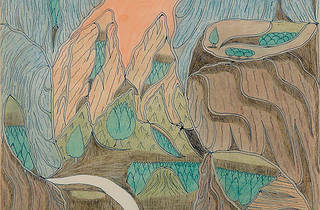 His mountains have strange, biomorphic contours whether they’re in Italy or Vermont. 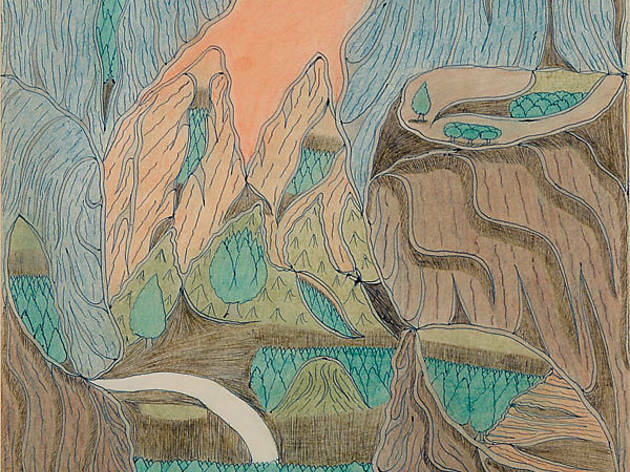 Yoakum made brilliant use of his humble materials—he usually worked in pen, later adding colored pencil and chalk—but his sunsets and rivers are always the same shades of pink or blue. Yoakum’s local supporters didn’t care that his work lacked realism. Many were artists who found inspiration in its fantastical elements. Half the drawings in “The Picture Tells the Story” come from the collection of Ray Yoshida, the beloved School of the Art Institute of Chicago (SAIC) professor who died last month. During the last years of Yoakum’s life, soon-to-be-famous students of Yoshida and SAIC art historian Whitney Halstead—most notably Ramberg and the Chicago Imagists Karl Wirsum and Roger Brown—frequently visited the artist’s 82nd Street studio on the South Side. Yoakum’s landscapes are devoid of people, but many show signs of bustling human activity. In a drawing of Pearl Harbor, viewers glimpse a jaunty submarine floating between the two rock formations that frame the image. A bright yellow train flows through a drawing of the St. Louis and San Francisco Railroad; it demonstrates Yoakum’s ability to convey movement through his remarkable manipulation of line and scale. The artist’s fans must also have been impressed by the intricacy and balance of his compositions—wherever one looks, there’s something intriguing to examine—and his unusual palette. In concert with his strenuously two-dimensional drawing style, these characteristics give Yoakum’s works the beauty of classic 19th-century Japanese prints. Considering that Yoakum said he sailed to Australia as a stowaway and joined the circus at the age of nine, the strangest aspect of his story is how much of it now seems to be true, according to Derrel B. DePasse’s 2000 book about Yoakum, Traveling the Rainbow, which Intuit has left in the gallery. Placing in context recent research that helped verify some of the artist’s tall tales, DePasse explains that the racism Yoakum encountered as a black man within the U.S. posed fewer obstacles abroad. Yet as curator Mark Pascale (moonlighting from the Art Institute) writes in the show’s catalog, the correspondence between image and place isn’t an important aspect of Yoakum’s drawings. Their significance lies in their appeal to our own memories and imaginations.